WORKERS WILL hold twice-monthly pickets to call public attention to Brius’ profit-driven care and its consequences for residents of San Rafael Healthcare and Wellness Center, Novato Healthcare Center, and other Brius facilities throughout the state. 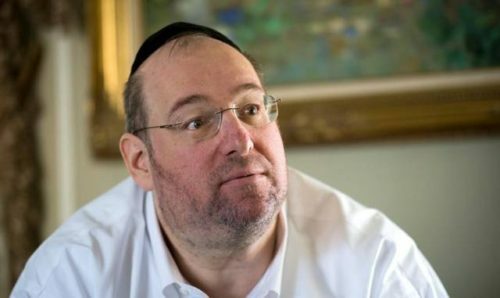 BriusWatch.org documents numerous government investigations, media coverage, lawsuits against California’s largest and most notorious nursing home company — owned by Los Angeles-based multi-millionaire Shlomo Rechnitz (pictured). Marin County — NUHW-represented caregivers at two Brius-owned Marin County nursing homes — San Rafael Healthcare and Wellness Center and Novato Healthcare Center — will launch a watchdog website, BriusWatch.org, and hold the first of a series of pickets on Monday, August 1, to protest conditions at the two facilities. The informational pickets will be held from 3 to 6 p.m. every other week at San Rafael Healthcare and Wellness Center, 1601 Fifth Avenue, San Rafael. These are not strikes or work stoppages. Workers from both facilities will participate. NUHW members report that Brius boosts its bottom line by minimizing the number of caregivers attending to residents. Most report that understaffing and a reduction in hours limits their ability to fulfill their responsibilities to residents and provide quality care. “Residents often do not get ambulated or even receive basic hygiene because there’s just not enough staff to take care of them,” said Maria Martinez, a Certified Nursing Assistant at San Rafael. Caregivers also report that understaffing, overwork, and low wages — many caregivers do not even earn a living wage and most haven’t had a raise in four years — cause experienced caregivers to leave for better jobs. “Our residents’ health and well-being depends on familiar relationships with reliable staff who know their needs and daily routines,” said Sukawadee Journette, a Certified Nursing Assistant at Novato. BriusWatch.org and its accompanying social media (Facebook/BriusWatch Twitter @BriusWatch) document the dire consequences these cuts often have for residents and their families. An investigative report by the Sacramento Bee revealed that Brius facilities have racked up three times the average number of patient-care violations for California nursing homes. In 2014, an unattended mentally ill resident checked herself out of a Brius home in South Pasadena and lit herself on fire, prompting a wrongful death lawsuit in which her family accuses Brius of “maximizing profits … by underfunding, understaffing, and under-training the staff.” In 2014, Brius’ dismal record prompted California Attorney General Kamala Harris to file an emergency motion to block Brius from purchasing nineteen nursing homes. Brius and its 80 long-term care facilities have been the target of FBI raids, investigations, media exposés, and class-action lawsuits. Brius nursing homes have been cited, penalized, and even decertified by government agencies, as well as criticized by consumer organizations and sued by nursing home residents and their families over Brius’ chronic resident care failures. Billing Medicare, Medicaid is the jewel in the crown.